Easy to solo-kite as fire-mage. The head didn't drop for me, killed him twice. EDIT: Droped for third time. Easy to solo as he can be stunned and snared, with relatively low HP. Hits surprisingly hard though, do NOT let him hit you. He hits for 11-12k on cloth. Shammies, he IS earthbind kiteable. But he's an absolute pain. Probably a lot easier if you've got a rooting totem. Drop totem in front of him, and unleash. And keep moving. Always keep moving. Solo'd as an 82 ele shammy. I have 44k HP, and 3 hits from him is deadly. Trivial to solo as 80 frost mage. Mirror Image and Water Elemental keep him occupied while you lay down the hurt. "The new residents of Smuggler's Hole will feel considerably safer knowing this monster is no longer loitering outside their haven." This means that if you want to be able to loot the quest-starting item, you'll have to do the quests to get Adarrah, Captain Samir and Mack inside the cave first. If you haven't done those quests, then don't bother! You won't be able to loot the head otherwise. He can be taken down in a simple but mind numbing manner of rooting, throwing some ranged damage on him, and when he gets close switching to Aquatic Form and getting some breathing room. With the Sea Legs spell, getting out of range is easy as pie. This can even be accomplished by Feral Druids (I know, I am one) if you have the patience or insanity. Tried to snare with FS and earthbind tot but too many mobs got in my way after awhile. So when he reset I said screw it and popped wolves and BL. Enhance sham should have no problem with him. Wolves should last till about 50k or below a little. After that he hits kinda weak unless he does his sea splash ability which will hit you for about 10-13k. Either take the hit and heal through it or run back a little to avoid. Did this as a lvl 82 with 42k hp. absolutely not easy to solo. He hits 12-15k. Q: Hey Gnash, why do you have a ship's wheel attached to the front of your shorts? A: Yarr, it's driving me nuts! Thank you, I'll be here all night. Killed gnash today and he didn't drop anything, was his head removed from the game? Wowhead is WRONG! It's not a 100% drop. I killed this guy on my mage, and the head didn't drop, to my surprise. No, I've never done the quest before either. Trivially soloable as a fresh 80 afflic lock in Northrend greens. I kited him with Curse of Exhaustion in the area in front of the Smuggler's Scar cave and just kept the dots up. Took about 5 minutes. Killed him 3 times and he hasn't dropped the head. Anyone else having trouble? I'm suprised nobody has mentioned this, but don't bother killing this guy before you have quests inside the cave or he doesn't drop the head. ...as I just found out after kiting this guy for 4 minutes for no reason! Also, with Sea Legs, Just run and dot. Use fear as much as possible. I killed him today by myself using this method. It was hard, and took a few minutes, but at least it got the job done. Very easily solo'd if u just kite him around. He walks really slow and never starts swimming. You will greatly out run him by just normally swimming. Soloed as lvl80 cata geared spriest just 5 mins ago, but was no loot for me. No Gnash's head, nothing. Maybe only drops when a quest leads to him, don't know. Easily solo'd at level 85 with ilevel ~330 as an Arms Warrior. Any level 85 should have no trouble killing him. Only reward is ~16 gold for turning it in. I'm surprised it hasn't been mentioned, but he can be stunned. Fun fact, this guy is so big you can see him from stormwind. Use /tar gnash the next time you are there, it should lock on. Not sure what's up, but I targeted him in the middle of Gol'Bolar quarry in Dun Morogh while looking for a Cook name Ghilm. Pretty interesting. he killed me on my shammy level 80 2x he hits my earth elemental for about 10-15k. maybe this is new or something. 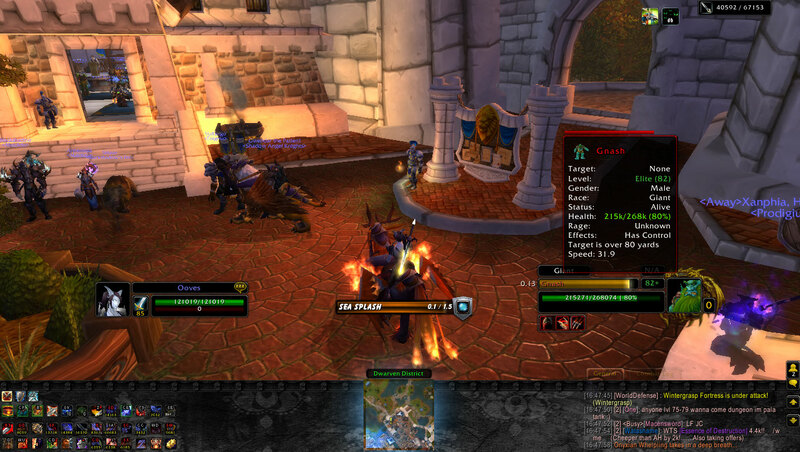 I remember killing him so easily with my other chars while leveling and I am aware that any level 85 can kill him. Soloed as a fresh feral tank level 80, with 30k armor. I started the fight with a frenzied regeneration and bark skin, was able to tank through the damage even after bark skin wore off, got him down to about 50k hp then he started getting me down cause the regeneration wore off. Popped off survival instincts, and mowed him down with lacerate. Soloed as an 80 blood dk in wotlk dungeon gear with death siphon and lichborne spec. Not particularly hard, just be careful to not pull the mobs around, some of them can stun you for a few sec, which can be deadly. And as it's been said, no quest item drops till you complete adarrah's quest. Very easy to solo as Fire Mage. He is snare/kite-able so just replace Fireball with Frostfirebolt and you can kite him around easily. I was lvl 80 with green gear from the npc in the ship, and this was not hard. This NPC can be found in Kelp'thar Forest (20).